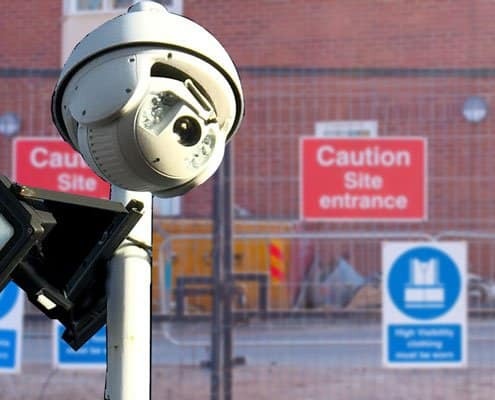 Advance Guarding can provide manned and physical security for your site or project. When you and your employees pack up and leave for the day the last thing you’ll want to be thinking about is whether or not your equipment and hard work will still be there in the morning! The construction industry suffers enormous losses as a result of theft of plant and materials and damage by site fires. It is estimated that between £600 million and £1 billion were lost because of plant theft alone from construction sites across the UK last year. More than 24,000 items of mobile plant were stolen with only between five and 10 per cent recovered. Unfortunately, it is a fact that most construction site theft is done by the site workers. A large proportion of these losses can be attributed to inefficient or even non-existent construction site security which is why as a builder you need a professional team to help alleviate the problem. It is just to easy for a casual worker to pocket small tools or arrange to come back later to remove a generator or other machine. Even security devices such as solid perimeter hoarding make their own problem as though the solid barrier is a deterrent to passing thieves it also shields the more hard-nosed and brazen thief and gives them a protection from being seen. Advance Guarding can bring an inventive but logical and orderly approach to construction projects. We offer a flexible range of services starting with that perimeter protection together with manned guarding through the night. This together with some modern technology such as movement detectors, CCTV and even simple lighting will make a difference. Construction sites are easy targets for thieves. Constant staff turnover means it is difficult to keep good construction site security records and with expensive equipment, tools and materials often left unattended, construction sites make for the perfect opportunity not only for thieves and vandals but also make for a hazardous danger zone for unsuspecting children who simply see your site as a playground. As a security company, we are well aware that security is recognised as a ‘grudge’ purchase in this sector as budgets are normally tight if there at all. With this in mind we can work closely with our construction customers to devise a security solution that is practical and robust whilst listening and aligning to cost pressures to drive the innovation they need to protect their people, property, plant and materials. Advance Guarding will provide construction site security to your site using licensed SIA trained guards at competitive rates. We understand that every client has unique security concerns and that’s why our experts will work closely with you to pinpoint security risks, set your program goals and help you understand the variety of security solutions available. During the day, access control and random vehicle and bag searches will give the idea of a professional approach to criminality on site. If this level of security is planned and started from the beginning, the whole site team will know you mean business and won’t allow any compromise. During the night and weekends, either monitored cameras with movement detectors or better still, a Security Officer will ensure what is yours stays yours. Advance Guarding has developed bespoke, comprehensive training courses tailored to the construction, building and civil engineering sector, recognising the ever growing security issues and specific threats faced by this sector. Advance Guarding can supply all security needs to your project within 24 hours or sooner so, call 01903 269 990 today.